In this post, Crested Butte Avalanche Centers' Josh Hirshberg reviews the meaning of Considerable Avalanche Danger (3/5). More people are caught in avalanches during Considerable Danger than at any other time. During the second week of December 2012, back to back storm cycles renewed the promise of a deep and snowy winter in the Elk Mountains of Colorado. For back-country skiers, epic faces-shots were punctuated with boot shaking signs of instability. During this period, I found myself pondering the exact definitions in the Avalanche Danger Scale. Paying close attention to the differences between, "probable", "possible", "isolated", and "specific" can help you be certain that you understand the forecast. While the differences between these words may sound like inconsequential semantics, they are anything but. It may surprise you that the forecasters at the Crested Butte Avalanche Center read the definitions of the Avalanche Danger Scale almost every morning. There are days when we may spend fifteen minutes mulling over the specifics of a danger rating before issuing a forecast. This attests to the importance we place on the danger rating. 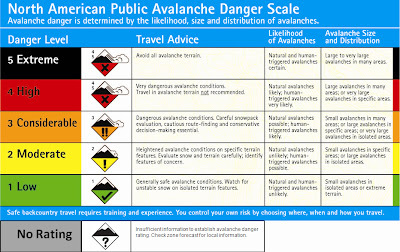 First, some basic criteria would say that “dangerous avalanche conditions” exist under a Considerable rating, and “careful snowpack evaluation, cautious route-finding and conservative decision-making” are essential to staying safe. Though there may be some inherent risk to backcountry skiing and riding, it’s not often that it’s “dangerous” per say. During times of Considerable danger you really have to be on your game. The conventional way of thinking about Considerable would tell us that “natural avalanches are possible” and “human triggered avalanches are likely.” This isn’t a time for that romantic picnic lunch you’ve been planning in the middle of your favorite avalanche path. During Considerable danger there’s a good chance you will see natural or human-triggered avalanches if you are travelling in the backcountry. You want to minimize the amount of time that you are in any avalanche paths to minimize your exposure. According to the size and distribution, during Considerable danger you could see “small avalanches in many areas, large avalanches in specific areas, or very large avalanches in isolated areas.” In case there’s some confusion with the terms, a large avalanche is something you definitely don’t want to be caught in. This could be big enough to break trees or bury a car. Meanwhile, a “small avalanche” could still be big enough to bury a person. “Specific terrain” is a generalization, ie. it could be something like "most east aspects", while “isolated terrain” is less generalized, ie. perhaps rocky, convex start-zones above 35-degree convex slope. Size and distribution help explain how different types of conditions can all fall under Considerable. Additionally, forecasters strive to match the conditions with a danger that best describes it as a whole. The overall conditions and size and distribution are just as important to consider as whether we expect natural versus human triggered avalanches. Unfortunately, backcountry riders don’t get to choose which flavor of Considerable they want, but the forecaster often emphasizes the most pertinent elements of a given day’s Considerable. This helps explain why during mid-December we had so many days that were Considerable. Some days we expected human triggered slides and maybe some naturals, but we new they would be small. Other days we didn’t think there would be lots of activity, but we knew anything that ran it could be big. Some days were really heads up with many small avalanches everywhere and a few large slides on specific slopes. Forecasters consider the Danger Scale to be an exponential scale. One step up on the Danger scale could mean that you’re 10 times more likely to trigger an avalanche. There are lots of times when we can get great powder in the backcountry and even shred some pretty steep slopes. It’s critical that we learn to recognize when it isn’t safe and how to modify our terrain choices to not get caught in dangerous conditions. If you take some time to review the danger scale, you’ll start noticing how much the CBAC forecasters incorporate the definitions into the daily forecast. Like most readers, the CBAC forecasters are excited for a powder-filled winter. We dream of endless fresh tracks, but most importantly we strive to keep our community safe while enjoying the backcountry.